Promotional activities as part of the business goal: what is the GOAL?! The point of every company is to create value… value for shareholders and/or stakeholders. This is basically a broad goal that shapes business strategy and its individual goals, as well as business activities. Google’s slogan is – “don’t be evil”, while their business vision entails providing access to all information in the world, to everyone in the world. Well, it’s clear that that this isn’t a business goal but a vision. However, such a vision creates ambitiously linked goals which result in revenue and even in profit. They result in profit, but profit in itself is not the end goal. Oftentimes, you hear management and others define “business goals” as “reaching a 20% market share”, “increasing profit by 10%”, “increasing the profit margin from 15 to 20 percent” and such. You should fear any manager that holds an executive or administrative position and doesn’t distinguish the goal from an effect/result. On the other hand, if this is indeed the case, why not simply ask him – Why? Why is THIS the goal? Take a look at this handy technique also known as the “5 Whys” for understanding cause and effect. 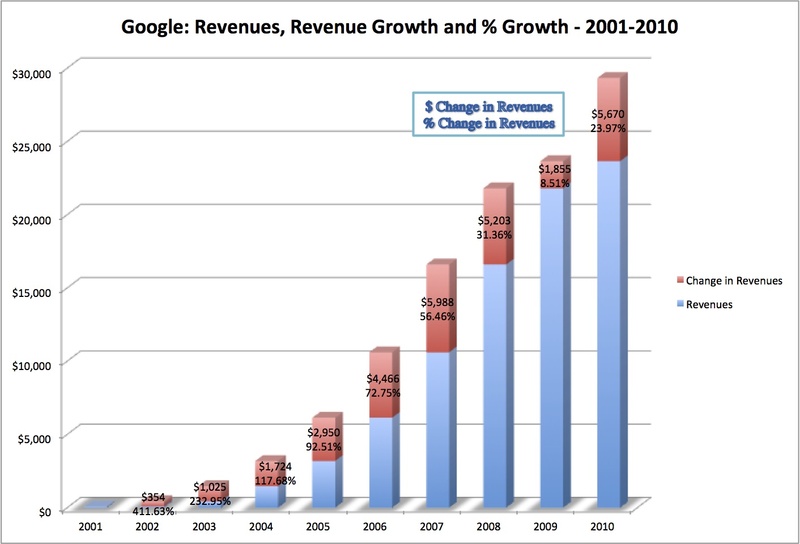 Google’s truly inspirational goal didn’t hold it back from building a company whose revenue exponentially grew from its first year in business. An inspirational way of doing business isn’t a question of philosophy without practical and economically competitive business results. Such a business model is based on profit as an end result. Of course, upon creating an inspirational vision, it’s necessary to steer the company’s development carefully while continuously putting the vision into effect, step by step. As a result, I increase my competitiveness and performances which lead towards an increase in my revenue and proportionally to that – an increase in life quality which contributes to achieving my goal. The goal is not to have more money. Money is the result of a combination of activities leading towards the realization of the goal. You don’t go to the pharmacy to get aspirin, but rather to purchase a remedy that will help rid yourself of a headache. Aspirin is only a means for achieving you goal. A goal has a purpose. The means serves this purpose, and not vice versa. Judging by how much I wrote in the introduction, I can see that I don’t write nearly as often as I’d like :/ I do believe that those of you that follow my blog understand the aforementioned ideas, and I wanted to write them down once and for all. There’s no story about business without understanding the ambiguity that surrounds the goal and the means – the cause and effect; the manipulation and inspiration. When our goals are visionary, business is an adventure. When our means are our goals, business is a collection of manipulative techniques that give short-term results. After having watched Simon Sinek’s “Start with Why”, I read his book that helps me out in business (and in life). Simon dedicated an entire chapter of his book precisely to manipulation techniques that we implement when we don’t have a vision and a clear long-term business goal. He also described problems, as well as the advantages of these techniques, but also of business models built and based on them. There are virtually no products or services that cannot instantly be replaced by similar or better ones, based on a similar or better price, for a similar or better quality. Even if you happen to be the first on the market, it’s only a question of time until someone else will come up with a similar (or better) offer. However, if you happen to ask almost any manager about why his/her users enjoy their product and not someone else’s (which is similar or better), they will tell you that their product offers superior quality and unique packaging at a better price, offering better service. In other words, they have no idea why their customers are really their customers, taking into consideration the fact that a viable replacement to their product exists on the market. Logically, they have no clue as to how to further develop their product in order to win customer loyalty – the holy grail of a successful business model (these aren’t my words, but a loose interpretation of a segment in Simon’s book). What do companies do when they don’t have a vision? Price – lower the price of your product enough and there’s no doubt that you’ll sell it. Jung’s “Red Book” for $1, a huge chocolate cake for $10 or an iPhone 5S for $100 will surely find a buyer in no time. The question that remains however is whether you as a company are ready to pay for lowering your price? The question therefore isn’t about whether you’re ready to accept decreased profit margins during a given period of the year, but rather whether you’re ready to accept the fact that users will have a hard time accepting to pay Jung’s book for $1000, a cake for $100 or an iPhone for $700 once you’ve lowered the prices. In such a way, an army of sales-addicted consumers is created. Then ask yourself how many people you know that wait for the sales in order to purchase their favorite article of clothing. Why would they buy a product for the full price when they know that they can get it at a reduced price (either from you or your competition) at a lower price? “Priced to move” is an American sales model that led millions to the point of no return, addicting them to a drug called “SALE!” Are customers during sales (the only) target group for whom you do business? Even if they’re not, the market has set sales as a business norm. It’s not easy changing the norms, but many have succeeded. Apple, for example, doesn’t have sales on its iStore. All of their products around the world are priced the same (without minor differences due to currency exchange rates). I’ll mention this here too – Apple has become the most valuable brand in the world this year. It’s not easy changing the norms, but many have succeeded. Promotions – a manipulative technique also known as “buy one, get one for free”. Promotions are offers which entail buying products for the full price, although you are given (at least) something free: 200g of coffee + mug, dishwasher liquid + gloves, book + agenda, or something similar. This is a rather tricky trap because it’s difficult to attract a consumer to buy a product that isn’t on promotion for its full price (that is – without the free goody). If your coffee isn’t on promotion, count on the consumer to look (or buy) your competitor’s coffee that “gives” them a free coffee container or a recipe book. This is the point where you enter a vicious circle… In such a way, we accustom the consumer that there is always a better offer than the good offer. Better for their pocket, regardless of whatever else. The power of this technique and the speed of achieving tangible results have led us to a situation where it’s increasingly difficult to sell products that aren’t being promoted… unless we implement another one (of the here described) manipulative techniques. Fear – one of the most powerful manipulative tools; the real and the fictitious. When you run out of ideas or inspiration, scaring the consumer works really well. Within the marketing industry, IBM is well remembered for their campaign that scared decision makers in the IT departments some thirty years ago. “No one ever got fired for hiring IBM” left a strong impression on the target group. Even though they would have given a chance to to smaller and less renowned companies, decision makers in the various IT departments chose not to risk their jobs. Take a look at the commercial for Vojvođanska Banka which isn’t the best example since the fear effect is over exaggerated due to the artistic nature of the advertisement, but it illustrates the model suitably. Lower is a commercial for Paradontax toothpaste. No extra words are necessary to describe it. Positive aspiration – contrary to using fear as a technique, encouraging positive aspiration inspires consumers… but only in the short term, of course. Peer pressure – because some decision are tough tom make. The lack of understanding and the lack of distinction of goals and vision, results and consequences, manipulation and inspiration, aren’t just global business issues, but that of politics as well. Manipulation will help you persuade people to vote for you, but not to follow you. Manipulation will help you to convince them to buy your toothpaste or shampoo, but not to refuse a better offer or price, nor be loyal to your product. Inspirational vision breeds an ambitious goal with which we inspire the world. Such a vision connects us with our consumers so profoundly and on so many levels, that eventually loyalty is established – a secure base of dedicated customers that will be by our side during both the stormy and fair weather that we encounter along in our business endeavors. Working for yesterday, for now or for tomorrow – is also a question of vision. If you don’t know where you’re going, every road leads you there. Think twice, because you live only once. Draga Dragana, pratim te dosta dugo, i čitam isto toliko, i kao neko ko radi u otprilike istim vodama kao i ti, moram da priznam da se u potpunosti slažem sa tobom! Neko je daleko pre rekao : “Ne možeš znati kuda ideš, ako ne znaš, gde se nalaziš i odakle si krenuo!” Ta rečenica se može protumačiti na toliko različitih nivoa i može vrlo lepo objasniti pojam “vizije” kako u privatnom tako i u poslovnom životu. Drago mi je što u Srbiji postoje takvi vizionarski umovi kao što si ti, samo tako nastavite.